leelas hobbies: Easy Threading Needle! All of you are in familiar with needle threader given below..
here iam introducing not a threader but an easy threading Needle..
for online shopping link is "HERE"
This needle has 2 eyes in the head..the top of the eye (slot-eye) has been cut to allow the thread to pass through from above..see the pic below..
To use, simply hold both your needle and thread with the thumb and forefinger of one hand, and with the other hand, grasp the thread, pulling it gently but firmly over the "V" down into the eye of the needle..
when you stitch and pull the needle repeatedly,the thread does not easily pop back out of the opening..thats how the needle behaves..3 strands can be passed through the slot easily..and this needle is too sharp as well..
so not to worry guys! no need to squint as well ! The lower eye is designed as usual way we are all familiar with: after squinting, pass the tip of the thread through the eye of the needle and pull..Hmmmm toooo boring isn't?so always try to use the slot-eye..
Good idea ! Nice Product !! I have seen this with my daughter-in-law who is at Dubai. Yes.... yes.... it is so easy to aged people like me ! 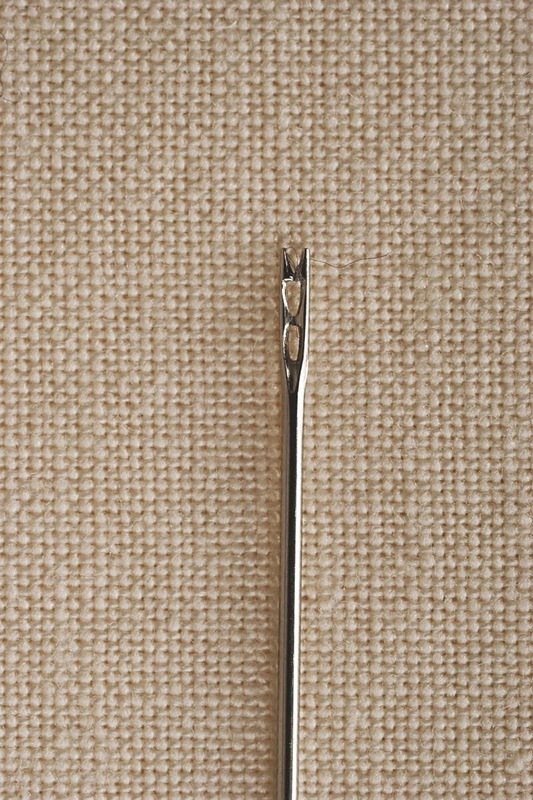 I use this needle for my embroidery and other stitching. Just love this needle. I have even gifted this to my friends. Got this from abroad. Dont know whether it is available in India. Hi Leela, I have had a pack of these needles for some years but not used them. If you like them, then I will try them at long last. thanks maureen..why didnt you try this needle so far?i used only this one for the whole SAL tutorial..no need to squint and i can thread it now and then with ease..not to depend on others as well..in my words its a boon for me and 'a good useful sewing tool'..
you must try it and plz feedback..
Hi Leela, I've been away for a week but will test the Easy threader needle today. I've forgotten why I had not used the needle before but as I'm short sighted I rarely have bother needle threading. I'll let you know what I think of the needle later. thank you maureen..soon awaiting your opinion about the wonderful needle..
Hi Leela, I finally tested the easy threader and found after a few false starts, to be very good. At first 2 strands of DMC snagged on the end but once in, it did not easily slide out. Maybe I should have used a larger needle from the packet. Also I found I could use almost all of the thread length, as it remained gripped in the eye. Thank you for reminding me about the needle. thank you maureen for the prompt feedback..happy to hear from you that you could use the needle which hadnt touch so long..
Hello. Nice to see this wonderful blog, but u seem to have missed out to mention a few other major hobbies of yours which u have developed over these recent years.